Well, Thursday was supposed to be my grand expedition to Chicago - not a place I often go. But I've been planning since August to go see an exhibition of art from Little Golden Books. Weeeelll, I suddenly figured out Wednesday morning that it wasn't until next year! I had already put in for vacation, cancelled storytime, etc. so I decided to do something else. I went to the Milwaukee County Zoo! They had the most adorable tiger cubs - and they put on an amazing show of cuteness! And cute prairie dogs that actually came trooping out for us to look at. And a new HUGE hippo. Ted Naifeh's first three Courtney Crumrin collections. And I found a spice shop where I got saffron for Lucia buns for Christmas and hardly got lost at all coming home! A very nice day. Of course, you did not expect me to neglect Jean Little's newest novel? Even amidst Cybils reading, Goosebumps parties, and exciting colds. Jean Little's pervading theme is hope and tenacity; her protagonists are stubborn try-try-againers and there's always hope that they will have a family, friends, and success in their struggles. Dancing Through the Snow is no exception. Litterbin Min, as a mean bully at school labels her, knows she's a throwaway. She doesn't know who her parents were, the woman who raised her abandoned her, and every foster family has given her back. And now she's being dumped back at Children's Aid again, only a few weeks before Christmas. But this time, it's different. Jess Hart, the doctor who's been in and out of Min's life since she was small, happens to be passing and suddenly Min is scooped up and plunked down in a loving home for the holidays. Jess, who had an even more traumatic childhood than Min, is the first person who really understands; and she breaks Min's hard shell and opens her heart. Experiencing the healing power of love Min begins to learn to give back; to an abused and damaged stray puppy, to Jess's godson, and to her new friends at school. A new life, a new family, and a new Min: it's the perfect Christmas miracle. Verdict: A story of hope and new beginnings, perfect for middle grade readers who like realistic fiction or for a family read-aloud. Detective Penny and lazy Rio solve a mystery, make new friends, and learn an important lesson. At least, that's the main gist of the descriptions. It doesn't really work that way in the story. First, there's not actually a mystery - it's more of a problem; how to unlock a padlocked doghouse. There's some brief speculation on why it's locked, but this is never explained. They do make a new friend, what appears to be a Great Dane, who has moved in next door. He is, stereotypically, rather stupid (of course, big = stupid) but friendly. Penny, and eventually Rio, are trying to unlock the doghouse to help their other new friend Squeaky, a mouse. They try breaking the lock, looking for the key, and finally tip the doghouse over so Squeaky can crawl in the hole. The secret he has hidden inside turns out to be photo albums of his family. Penny and Rio realize that family is the most important thing, and are glad they've made up from their fight over bones the night before. The writing is stilted and depends heavily on dialogue, but the characters' voices aren't distinct enough and the story is extremely confusing - the reader is never quite sure who's saying what. The elements of the plot are haphazard and don't fit together well. The layout, design, and illustrations have problems also. The book is a slim paperback - only 43 pages - but the reading level is too high for it to be an easy reader. There's also no title on the spine. From a library perspective, if you buy this book despite the serious writing flaws, it's going to disappear into the shelf. Inside, the book, the illustrations are flat and lifeless with odd color combinations, looking as though they were hastily sketched with computer graphics. Several illustrations are repeated throughout the book without variation. The type is heavily bolded and unevenly spread over the pages. Verdict: Not recommended for libraries or individual purchasers. Children looking for beginning chapter dog or mystery stories should be steered towards Lucy Nolan's Down Girl and Sit series or, at a higher reading level, Hank the Cowdog by Erickson. Another cute little elementary school girl. "Yeah", I can hear you saying, "what's different about this one?" You got your Junie B., your Clementine, your Lucy Rose, your Piper Reed, your Sassy....Well, some things are different and some aren't. Quirky, exuberant, extrovert little girl? Check. Making mistakes and learning at school? Check. Male and female friends? Check. Mostly uninterested in "girly" stuff and very scornful of all things pink? Check. And (what rapidly seems to be becoming part of the checklist) divorced parents who get along just fine? Check. But there are a few differences that make this story stand out - just a bit - from the rest of the herd. First, the story of Keena's mishaps and mistakes in second-grade is written in journal format. Obviously, it's not as a real second-grader would write it - it wouldn't be readable. No spelling errors, weirdly-shaped letters, and Keena's mom has given her a dictionary so she can look up long words. But it is written in a style that feels believable for a seven-year-old girl. Second, Keena Ford is much less heavenly and more realistically brat. She's snide to her brother, gets in fights, and her major mix-up happens because she is too greedy for chocolate cake and the special birthday crown to explain that it's not really her birthday. But she apologizes, she learns, and she gets going again, trying to do better next time. The black and white illustrations are soft and have a chalkboard look about them; they fit in perfectly with the emphasis on school and enhance key elements in the story. Verdict: This will be a fun read for girls who are ready for chapters and like school stories about spunky little girls. (Because of the girl-themed cover and plot, I'm not seeing any boys picking this up; I haven't had much success in booktalking the friends-school type story to boys.) It's also a good introduction to the journal format. Gilroy is excited about spending some time with his Grandpa while his parents are on a trip....until he sees his Grandpa's cooking. Octopus? Miso soup? Squid-kabobs? Those aren't food! He's even more upset when his grandfather brings all these weird foods to school. But when he sees his friends' excited reactions, he realizes it's not so bad to try new things and talks Grandpa into a compromise. There's a good basic story here, not just about trying new things but about a cultural and generation gap, since Grandpa's new, weird foods, appear to be traditional Asian edibles (Japanese maybe? I don't know enough to name the culture). The other students' unanimously positive reactions to Gilroy's grandfather's unfamiliar foods is a little unrealistic - they all want to try them and are enthusiastic, but Gilroy's stubborn refusal to compromise until the very end is realistically portrayed. The writing is a little choppy in places, but generally flows well and kids will enjoy the cartoon illustrations of a classroom of caricatured kids and exotic foods. My main complaint about this book is the odd format. It's a large paperback, almost the size of a picturebook paperback. It's not going to fit on most juvenile fiction shelves and being such a thin paperback will vanish without a trace if shelved there. It's also too big to be on the easy reader shelf and it's not a picturebook. The author has a good sense of plot, character, and dialogue, the illustrations are kid-friendly and advance the story, but the format is going to keep this out of most library collections and limit children's access to the story. I will be keeping an eye on the author to see if she keeps working on her writing and maybe finds a publisher who works with more traditional formats. Our second book is an easy reader biography of Harry Houdini. It's labeled as "level 3 read alone" easy reader, and the vocabulary and content is suitable for the reading level. 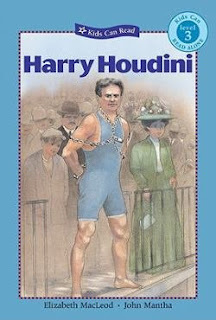 It contains many interesting facts about Houdini's life and focuses on his amazing escapes. However, I found the illustrations very blah and without character. In my library, most of the kids looking for biographies need something at least 100 pages long. However, if you have younger kids interested in Harry Houdini, this is a good starter biography. 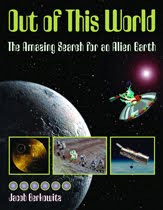 Verdict: These books are fine if you have a need for more information in these areas, but I'd recommend getting Sid Fleischman's Escape and Ellen Jackson's Looking for Life in the Universe, first. This Cybils review includes my own nomination: Down Girl and Sit: Bad to the Bone by Lucy Nolan, illustrated by Mike Reed. First, a quick recap for those unfamiliar with this delicious series of beginning chapter books. In the first story, Smarter than squirrels, We meet Down Girl, her friend Sit, and her arch-nemesis, Here Kitty Kitty! Down Girl explains the secret of their success as watchdogs - they are smarter than squirrels. Unless there are doughnuts around. Down Girl meets and defeats Here Kitty Kitty with the help of a mysterious monster, finds some excellent smells, has an exciting adventure with Sit, and makes some new friends. In the second Down Girl and Sit adventure, On the Road, Down Girl and Sit tell the reader about all the exciting things they do in cars, from a trip to the beach, going camping, and....oh horror! a trip to the vet! Will Down Girl survive the humiliation? Maybe, if Down Girl gets to "drive" the car! And now, the newest adventure - Bad to the Bone. Down Girl and Sit are worried about their masters. First, Down Girl's master just doesn't understand how dangerous Here Kitty Kitty can be. She touches things! She takes things! Down Girl must save her special rug from the evil clutches of Here Kitty Kitty. Next Down Girl and Sit's masters don't understand the two basics needs of a dog; food and attention. Down Girl and Sit decide they need to be bad to the bone to get the attention they crave. And it works! The next problem is that Down Girl's master doesn't understand how dangerous the neighborhood could be at night; and that Down Girl needs to be going in and out, protecting everything. But that's not the worst thing - Down Girl and Sit get taken on a nice walk to the park and meet a fun group of new dogs....and their masters forget their names! First they are calling everyone Sit. Then they are calling everyone Down Girl. Then they are calling everyone Hush, the name of the dogs' new friend! Down Girl needs a new method to train Rruff, her master, and she needs it fast before he forgets who she is! So, are these more than just funny stories about dogs? You bet. The reader is not just laughing herself sick, she's learning about layers in stories; figuring out the contrast between what the narrator, Down Girl, is saying and what's really happening. Beginning readers are learning to pick up on textual cues that point to an unreliable narrator. They're learning to see a story from different perspectives. And they're having a whole lot of fun! Kids will love the feeling of being "in the know" as they pick up on the subtle humor that's not too hidden for them to grasp. The black and white illustrations, from small insets to half-page spreads will help them get the essential humor of the narrative - Down Girl thinks she is in charge, helping her master, and getting things done, while in reality....well, she's certainly in charge! The writing style is concise, brisk, and humorous, the plot tightly and logically constructed, and the illustrations add visual cues to the story; everything a perfect beginning chapter book should be. Verdict: Hand these out to kids looking for funny stories, stories about dogs, books with chapters, and to teachers and parents looking for good read-alouds. The last castaways is the last adventure of Grandfather and Roo, written by the late Harry Horse in 2007 and first published in the US this year. Each of the adventures of Grandfather and Roo follows a definite pattern. They are written in the form of letters to an unnamed grandchild, "Dear Child". In each story, they set out on an adventure in high spirits and with great optimism, despite the opposition of Dear Child's mother, who thinks Grandfather is too old to go on adventures. A series of catastrophes and disasters strike, often caused by the cocky little dog Roo, and Grandfather finally despairs of survival, only to be rescued at the last minute. In this story, Grandfather and Roo set out to make their fortunes on the Unsinkable, sailing in search of Cod. Unfortunately, various disasters ensue, Roo manages to scuttle the boat, and the two are lost and starving before being cast ashore on what appears to be a desert island....a slight misconception that is fortunately resolved in time for all concerned. Grandfather and Roo return home and decide to settle down forever....until next time! Illustrated by the author, these are popular books in the UK and have plenty of humorous little asides and wacky adventures. However, they freak me out. I've read several of these little adventures and they never fail to strike me as depressing, morbid, and just plain weird. Grandfather's optimistic journeys always come to a point where he is writing letters to his "Dear Child" telling him or her that he will soon be dead. Each adventure is going to be his last, and Roo's consistent selfish and destructive behavior generally ceases to be funny after the first couple chapters. I have to admit, honestly, that I'm also influenced by seeing the animated short of The Last Polar Bears, with the particularly depressing part where Grandfather and Roo are in the snow, waiting to die. To me, these books aren't about adventure or humor at all; they're about trying to accept one's eventual aging and death. Oh, and if your kids are sensitive don't let them google the author because they're likely to come upon some particularly graphic accounts of the author's horrific death. Verdict: This is just my feeling - this last adventure has won the Nestles Smarties award in the UK and apparently many kids think the stories are funny and enjoyable (although the one I purchased for my library has very low circulation). I'd rather recommend the Charlie Small series to kids looking for episodic adventure in a journal or letter format. This Cybils nomination was a disappointment to me. Bonny Becker, author of award-winning Visitor for Bear and the very sweet Birthday for Bear (to be reviewed when I get to easy readers) has also written a beginning chapter book. Magical Ms. Plum has a Mrs. Piggle-Wiggleish plot, but just doesn't hold up to inspection. Ms. Plum, third-grade teacher, has the best classroom. She has classroom pets, lots of plum-themed stuff, and best of all...a magic supply closet. When students are sent to get something out, they always get a little extra; a magical animal that happens to be what they need the most at the moment. So far so good. But the pairings of misbehaving children and animals are....weird. First, we have a tomboyish little girl who is very scornful of a pink-loving girly girl. Tomboyish Tashala gets a miniature pony out of the closet and is thrilled; until it fills her desk with poop and she realizes a pony is work. Pink-loving Mindy turns out to have four brothers and is used to changing diapers and is the perfect person for the pony. The next pairing is constant-talker Eric Soderberg who can't resist finishing people's sentences, jokes, and answering every question. He gets a little parrot who tells everyone what he's thinking. Clumsy, quiet Darma who has no friends, gets a "squad of bright-eyed squirrels" who will help only her and nobody else. The other students decide that since she has "cool stuff done for her" she is cool...and Darma now has lots of friends. Jovi, an immigrant, is very uncertain and shy. He gets a wild hawk and gains confidence by setting it free. Jeremy is "the gloomiest kid in Ms. Plum's room". He always dresses in black, never smiles, and quotes Edgar Allan Poe. He gets a raven that says pig snout until he laughs. The next day he arrives wearing brightly colored clothes and smiling. Brad, who likes to play with the older kids and is tough, gets a fun-loving little monkey who helps him win some games. Emiko, who always looks on the bright side even when there isn't one, gets a nasty alligator she insists is a poodle; until she takes off her glasses and sees what it really is. Complaining Becky gets a little donkey that she and her classmates load with nasty notes; but when he looks miserable they take them all out again.Worrier Nadia gets a cute kitten that even Lucy, who tells her all the bad things she has to worry about, can't make her dislike. There's a second plot running through the episodes of Carlos, who's book-smart but people-dumb and so desperately wants an animal that first he tries to imitate the problems of the kids who get animals, then he starts snooping in other kids' stuff to make himself feel better, then sneaks into the closet. He gets a nasty weasel that only he can see and the promise of another chance someday.After each chapter, there's an italicized section. Sometimes it's a continuation of the chapter's story, sometimes it's about the kids trying to tell others about the magic and being unable to let out the secret. The magic and mini-animals are cute and there's a definite flavor of Mrs. Piggle-Wiggle's magic cures, but the story just doesn't work. There's too many episodes, leaving the stories of the different kids feeling half-finished and the cures (and problems) are illogical and confusing. Sometimes the magic seems to be just for fun; as in one of the italicized sections where everyone gets magic candy from the closet. Sometimes the fault or problem the magic is "curing" isn't really a fault - Jeremy's dark demeanor could be anything from incipient goth style to depression to symptoms of abuse. Handing him a silly raven and having him wear bright clothes instead of black is an odd and disturbing way to handle his "problem". Kids who have been ignored and picked on are pathetically grateful to suddenly have friends; enemies casually pass over past insults without apologies or explanations. The sketch-style gray and white illustrations seem to be trying to add a realistic feel to the straggling plot, but only manage to add an even more surreal element to episodes like the miniature monkeys bringing in the "candy cart". Ms. Becker's flap copy says she "hopes kids who read this book will feel less afraid of making mistakes, and will see that stumbles are a part of how everyone grows and figures things out" but having a nasty invisible weasel follow you around isn't exactly an incentive to make mistakes. And the idea that a little magic will mend kids' faults doesn't translate to real world lessons in social interaction. Verdict: Kids looking for stories of real kids making real mistakes will want to read some of the other funny and concisely plotted stories out there; like Keena Ford and Roscoe Riley while those looking for a little bit of magic will want stories with more logic and less haphazard moralizing. Here's the middle grade and nonfiction picturebooks I've read, looked at, am interested in, etc. from the Cybils nominations. Like you care, but whatever. I'm kinda behind on my nonfiction - I've spent the last couple months weeding like crazy, starting in January I'll be adding like crazy and have more stuff to wave around. And now, my obsessive listing of the Fiction Picturebooks nominated for Cybils! There should be a boardbook category next year. And that's the picturebooks! And lots of other teen fantasy I've bought for the library, especially all the Twilight read-alikes, but either am not interested in reading or haven't read yet. Graphic Novels - This is still a new area for me, so many of the Cybils nominations are new to me. Hmmm, I've read more than I thought I had. Yay for me! Hmm, I've read more than I expected! Yay for me! The only thing on the poetry list I've seen/bought was the Bill Martin Big Book of Poetry and that was a disappointment. Our nonfiction is in dire straits, and poetry is really at the bottom of the ladder - although I did replace some of the really worn Prelutsky and Silverstein. Anyways, I'm going to read lots of things on the list. Sometime. Maybe. And now it's time to get ready for posting my Cybils reviews! Yay Easy Readers and Beginning Chapter Books! Just when I thought we couldn't possibly use any more bedtime stories....I discover a new one. One which we must, must, must have! Milo and his friends Henry, Harriet, and Hildy hate bedtime. It always interrupts their favorite games, their best playing. So they decide to escape from it. But nothing works! Until they develop....the secret plan. The best words to describe the illustrations are warm and swashy (at least, that's the best I could come up with). There's lots of swirly colors, warm evening lights, and green and golden days outside. Verdict: This isn't just a soothing bedtime story, it's a story about the magical days of childhood, when just five more minutes is never enough and the simplest things are exciting and wonderful. This is a lesser-known story by the author of the award-winning Blue Willow. 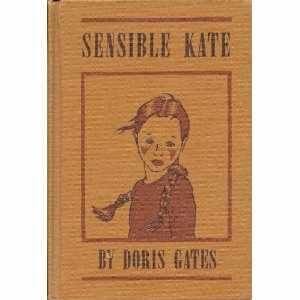 Kate is an orphan, recently handed off to "the county" by her shiftless relatives. When we first meet her, she's on her way to her first placement, as a home helper with an older couple, the Tuttles, on the California coast. Kate is immediately caught up in her new life, exploring the beach, meeting new friends, and starting at a new school. The theme of the story is Kate's self-proclaimed common sense. She's not cute or pretty or charming, but she is sensible and practical and is determined to make what she can of her few assets. With the help of new friends, Kate learns to enjoy the unexpected and sometimes put her practical instincts aside. The ending is expectedly happy, fulfilling all of Kate's secret hopes and satisfying the reader. Verdict: Like Kate's new friends, the reader will fall in love with the reserved, hopeful little girl and enjoy watching her grow and learn in her new home. School Library Journal says (among other things) "Teachers will be able to use this novel for Earth Day discussions and can foster conversations on environmental activism of all types." Please don't. This book is about activisim, yes. It's also about science, education, family relationships, initiative, curiousity, exploration, and wonder. It spoils it to make it educational! Julian Carter-Li is spending the summer with his cold and unpleasant aunt and uncle while his free-spirited mother wanders around China. He knows they don't like him, but when he sees an e-mail with just how much they don't like him spelled out, he's devastated....and reads the next e-mail calling his uncle a jerk, which is pretty much how he feels. Redwood forest next to her house from Julian's uncle and the corporation he represents. At first, Julian and his friend Danny Lopez are just trying to save Julian from math camp. But they get drawn into Robin's problems and Julian especially gets drawn into the Elder's warm and loving family. From an adult's point of view, the characters are somewhat one-dimensional. Good kids vs. the bad corporation, etc. But, um, excuse me SLJ, this is a kids' book and yep, that's how kids generally see people. Robin isn't interested in the other aspects of his nasty uncle's character - he just wants to get away from him. The deus ex machina at the end (which I won't tell you) is a little pat (ok, a lot pat), but this isn't meant to be a realistic story of environmental activisim, just a fun introduction. So happy endings are ok! Included in Julian's adventures are plenty of fascinating snippets of information about redwood trees and their history. Be prepared to have more information on environmental activisim and the redwood forests because this book will whet readers' appetites for more. And a homeschooling family that lives on an environmentally sustainable farm and has five kids but isn't involved in a cult and the parents aren't ex-hippies forcibly depriving their children of necessary socialization! French gets it exactly right - her homeschooling kids aren't all sweetness and light but they enjoy their life; they fit several homeschooling families I know who have chosen similar lifestyles. Verdict: A fun story for kids who like some relationships and social elements in with their adventures and enjoy reading about something a little different. My Cybils Nominations! and if you haven't nominated anything yet, please use some of my suggestions! Ok, folks. One. More. Day. Cybils Nominations close tomorrow! Get out there and nominate! If you need some suggestions, I've listed a few at the bottom of this post. My nonfiction offering today is The New Totally Awesome Business Book For Kids by Arthur and Rose Bochner. I've been looking at money and business books for our juvenile nonfiction at the library; what we had on the shelves was very outdated! Even for kids, business practices of the 80s aren't much help. Of the various titles I reviewed, this is a definite winner. It not only gives ideas for businesses kids can run on their own or with some help, it also explains, simply and practically, how a business works, how to work with people (including your parents) and how to stay organized and profitable. This is more than just a book on earning money, it's about learning life skills that kids will need throughout their adult working life. It's about economics, independence, being environmentally responsible, networking, and and taking ideas from daydream to reality. One of the things I especially appreciated was the authors' encouragement to parents to share financial information and work together on businesses as a family for success. Verdict: Financial success and responsibility should include much more than a class in high school on budgeting or economics and this book is a great starting point for kids who want to start their own business, parents who want to teach their children about finances, or anyone looking to start a simple family business or fill in a long and boring summer! Welcome to Nonfiction Monday! Please post your links in the comments below and I will add them throughout the day. Great Kid Books takes a look on the wild side today with Fascinating Animal Books for New Readers - Easy Readers for Nonfiction Monday. Betsy reviews If America Were a Village by David J. Smith over at A Fuse #8 Production. INK: Interesting Nonfiction for Kids has new posts by authors Melissa Stewart, Susan E. Goodman, Barbara Kerley, Vicki Cobb, and Rosalyn Schanzer. Roberta at Wrapped In Foil failed to write a review this morning because the books she chose were full of errors. She'd like to know what to do when you find factual errors in nonfiction books? Wendie's Wanderings has reviewed Laura Purdy Salas' new alphabet books including A is for Arrr! a Pirate Alphabet. Ah, here's our big cart. First, the YA, because except for the holds, the new YA materials are actually going onto a cart back in my office - they won't go on the shelf until our "grand opening" of the new teen area on the 19th. Van Alen Legacy by Melissa De La Cruz. I've had a hold request for this on my desk since last February...It's finally here Amanda! Front and Center by Catherine Murdock. This one also...I've skimmed bits and pieces of Dairy Queen - someday I'll sit down and read the whole thing. Wish you were dead by Todd Strasser. Didn't realize until I saw more reviews that this isn't a typical Strasser, more a mystery/thriller, which is ok as we need more mysteries. Demon King by Cinda Chima. A gamble - I have a couple firm Chima fans, but will they want to read a long "high fantasy" novel? We'll see. Going Bovine by Libba Bray. Part of my "more funny books with non-gender-specific-covers campaign". Gorgeous by Rachel Vail. The previous book, Lucky, was very popular here. Liar by Justine Larbalestier. I skimmed the end really quickly. Woo. This isn't going to be popular with everyone, but it's definitely going to find readers. Leviathan by Scott Westerfeld. Sigh. I have to wait my turn on the holds list. Ask and the Answer by Patrick Ness. The first book, which I got about a month ago, checked out several times, so I went ahead and added the second. Treasure Map of Boys by E. Lockhart. I thought this would be popular - I was right, it went right out on a hold. Spellbinder by Helen Stringer. Debated putting this in juvenile, but it's right on the edge and I'm guessing the sequels will be older. My Review. Are you ready for the next stack? Last spring, I reviewed a delightful and hilarious book, Melonhead by Katy Kelly. When I discovered there was a previous series about one of Melonhead's friends, Lucy Rose, I just....well, I feel like there are an awful lot of spunky girl series. Piper Reed, Clementine, Allie Finkle, Junie B. Jones, Amber Brown, Pain and the Great One, Judy Moody...see what I mean? Other than Horrible Harry, where are the boy books? Not counting spin-offs of the girls' series, like Stink. Anyways. I just wasn't interested in yet another spunky girl series. But as I was nominating Melonhead for a Cybils, I thought I'd check out Lucy Rose. And, well, I fell in love. She's more than just a spunky girl, and she's definitely not (as some publicity blurbs say) the successor to Junie B. Jones. Frankly, Junie B. is an irritating brat. Lucy Rose is, clearly, Fancy Nancy in a few years. Things go wrong sometimes, but she means well. She has a definite sense of style, loves words, and is always eager for new experiences. Friendly and exuberant, she's that energetic little girl who's the life of the classroom and is always coming up with new ideas. In her first story, Lucy Rose: Here's the Thing About Me, she and her mom have just moved to Washington D. C. She's feeling worried about her parents' separation, misses her dad, old school, and old friends, but she's ready as ever for new experiences. She makes a new best friend, Jonique McBee, and a new enemy, Adam Melon (yep, it's Melonhead's first appearance!). And, which makes the story perfect, there's a guinea pig! Yep, Lucy Rose's driving ambition is to take the class guinea pig, Jake, home for spring break. This is a funny and well-written story that sticks out head and shoulders above the other spunky girl middle grade fiction out there. Lucy Rose's second story, Lucy Rose: Big on Plans, is a fun summer adventure. Lucy Rose is now good friends with both Jonique and Melonhead, but there's a new girl in town - Ashley - and she quickly becomes Lucy Rose's nemesis. But despite Ashley's nastiness, Lucy Rose sticks to her summer plans and has fun at summer camp. Unfortunately, she doesn't manage to get one of her plans to work; keeping her parents from getting a divorce. This is the only aspect of the Lucy Rose stories that strikes me as a bit, well, wishful thinking. Lucy Rose's parents are still friends. Good friends. He compliments her cooking, they get along well, they work together to parent Lucy Rose, and there's no indication they were fighting or having any issues before they separated. That just seems...weird. So one day Lucy Rose's parents just decided they didn't love each other any more and separated but they're still good friends and they promise Lucy Rose they will never be mean to each other. If I was Lucy Rose, that would totally freak me out. (personal interjection of me - I am majorly not in favor of divorce "because we just don't love each other anymore" especially when you have kids.) That always drives me nuts in divorce books for kids. Kids are not dumb. If you can love someone enough to marry them, make promises, live with them, and have kids with them, then just stop loving them, break your promises and get divorced, there's no logical reason you are going to keep loving your kids and not break your promise to keep loving them. Like I said, kids are not dumb. Of course, there may be some other major reason they have gotten divorced which they are not telling Lucy Rose. An affair, her dad is really gay, her mom wants to pursue a career elsewhere, they went in different directions in their life, blah de blah. But I'm also majorly in favor of being honest with kids, even when it's only to say "you're not old enough to hear that now". Anyhow, as I said, this aspect of the story really bothers me, although I am sure there are stories of amicable divorces out there. Sure. This has been an adult digression and peeve which I do not think will affect kids' reading of the story at all. On to the third story. Lucy Rose: Busy Like You Can't Believe. Lucy Rose's big project and excitement of 4th grade is the coming class play. She's absolutely sure she is going to be the star, Annie. Lucy Rose is also dealing with gossip and eavesdropping and learning some important - and sometimes hurtful lessons - about respect. Ashley is still a pain, and Lucy Rose has a big disappointment at the end that she has to deal with in a mature fashion. Being Lucy Rose, with the help of friends and family she manages to see the silver lining and come out on top! The fourth - and apparently final - Lucy Rose story, Working Myself to Pieces and Bits - is all about friendship. Lucy Rose's best friend, Jonique, and her family are starting a new business and need some good friends to get it off the ground. Ashley is causing Lucy Rose some serious problems that affect her friendship with Melonhead. And Lucy Rose has to deal with some sad facts about her friendship with the folks at the nursing home. Verdict: Lucy Rose is an unforgettable, lovable, and hilarious series that's a great addition to any middle grade collection. I'm looking forward to the new Melonhead book this spring and hoping for further stories - maybe about Jonique? This year, I was going to wait until the last minute so I could make sure my favorites got on the list. Well, I couldn't wait any longer so I got started! But I still haven't decided in a couple categories. This is such a fun, sweet book and very popular at my library. As you can see, I'm TORN. If any of these were favorites of yours, please nominate some and help me make up my mind! Poetry - I don't think I nominated anything in this category last year either. I think I've bought maybe 2 poetry books for the library this past year. I got dinosaur and train books instead. I'm a happy fan of Sylviane Donnio's I'd Really Like to Eat a Child, so I was pleased to discover that the illustrator, Dorothee de Monfreid has her own book translated into English. 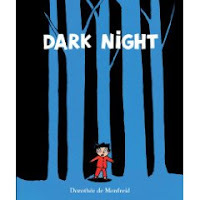 With sparky colors and bold lines, she tells the story of a little boy in a dark forest who scares away the dangerous creatures with a little help from a friend. Verdict: The spare, exuberant text is full of wonderful noises and children will be breathless in anticipation as the little boy escapes from the dangerous animals and makes his way home to a satisfying conclusion. New books for me, myself! I rarely buy new books. I get about 80% of the books I read from the library (our circulation staff is very long-suffering about carting my stack of holds back to my office every day), and the rest mostly from BookMooch, occasional trips to Half Price Books (less now that I no longer live down the street - ah, Austin Half Price Books how I loved thee) and the very occasional review copy (not counting my first trip to ALA last July when I really cleaned up). But sometimes...the books aren't at the library, on BookMooch, or at Half Price and I just HAVE to have them. Like last summer when I lost patience with collecting Kerry Greenwood mysteries one book at a time from Australian Bookmoochers and splurged on buying the rest of the set. So, my current splurges: Soulless by Gail Carriger. I've wanted to read this ever since I first heard about it and nobody in our library system has it (a sad fact I hope to remedy as soon as I have time to do a little persuading of the adult fiction buyer). Betraying Season by Marissa Doyle. Same thing here, except it's YA so technically I could buy it, but the system's circ stats for Bewitching Season don't warrant it and I have a backlog of popular and "important" YA to buy. But I got them for me! Maybe I will give them to the library when I've read them. Maybe not. My other splurge....I bought all four volumes of Tove Jansson's Moomin comic strip, put out in gorgeous hardback by Drawn and Quarterly. My library is one of the few in the systems who owns the first, and the only one who owns the second. I've tried moving them from ya to juvenile, displayed them here and there, and booktalked them, (i.e. forced small children to take them) but they just don't circulate well. So I got them for me. I won't be reviewing them because, well, you either understand and love Tove Jansson or you completely don't get her. There's no middle road and non-Moomin lovers, well folks, I pity you deeply. Something essential in your soul is missing. Someday I'm going to Finland to visit the Moomin museum and Moomin World theme park. But right now, I'm going to bed. P. S. Have you nominated for Cybils yet? Still lots of time! First of all, there is a typo on the first page. A typo! In a Candlewick book! "They exude all a human desires". It took me a while to figure out that the cover is the side of someone's head. Someone...whose ear has just been ripped off, to judge by the bloody smear they're sporting. Ewww. The book is a mixture of vampire myth and lore from the classic Dracula to the new movies and books. 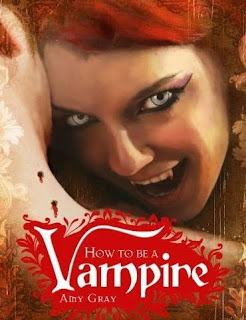 It includes quizzes on your vampire "type", style tips, things to do when you're a vampire, how to tell your family, etc. I found this book really strange and faintly disturbing; but, I am not a serious vampire fan. Actually, I find vampires really strange and faintly disturbing. I mean, they're dead and have you noticed they're all really obsessive? Even non-Twilight vampires. Apparently being dead makes you enigmatic, secretive, controlling, and just plain weird. But, as I said, that's just me. Verdict: Twihards and wannabe Goths will be thrilled to find this in their Christmas stocking. It's got tons of cool info on vampires and they'll enjoy trying to match up the descriptions with various books and movies. There's also lots of harmless activities (personally, I think coming out to your parents as a vampire should be good for weeks of fun. Heh heh heh) and the book is full of pictures from vampire movies and lore. Let me explain this. You see, I grew up reading Tintin and Asterix comics. I never really thought of them as "graphic novels" or even "comics". They were just books with extra pictures, you know? I also read Peanuts and Calvin and Hobbes - those were cartoons. So I got to library school and (I don't remember what class this was) but for some reason we all had to be introduced to "real" comics and the chosen introduction was Neil Gaiman's Sandman. Having never heard of this, I agreeably picked a Sandman collection at random from the library's catalog and had it sent over to my branch. It turned out to be the one with the serial killers' conference and it COMPLETELY FREAKED ME OUT. I do not ever, ever read horror. I don't even watch PG-13 movies most of the time. Aaagh! I couldn't understand why everyone was so excited about this guy. I took a couple cautious looks at his blog, but with the trauma of Sandman fresh in my mind, my general thought was "I don't want to meet this guy down a dark alley." (and I don't care how much you swoon over him my friends, he doesn't look like that really, b/c I saw him at ALA. and he looks more creepy-tired than creepy-swoony. he just looks like that in pictures). Well, I recovered from my traumatic comics experience, and discovered that Marvel Adventures and Star Wars comics and other similar things are about my speed and I love them. And then Neil Gaiman won a Newbery. And I'm all "I never read books just b/c they won an award. I don't care." and all the reviews are all "a fantasy won a Newbery." So I read it. And I quite liked it. And then he wrote this little book called Odd and the Frost Giants. And I'm all "it doesn't look interesting and I don't like Brett Helquist b/c he totally destroyed the Green Knowe stories by designing icky Series of Fortunate Events covers for them." If you haven't noticed, I'm a nit-picky reader. But then I realized that it involved Norse mythology. So I HAD to read it. And it was good! Although it's a short little volume, it's not a beginning chapter book, just a quick read. It's quite funny while still keeping the flavor of the original myths. Recommended for reluctant readers and fans of Rick Riordan. Now, no more procrastination, I've got to do the dishes.